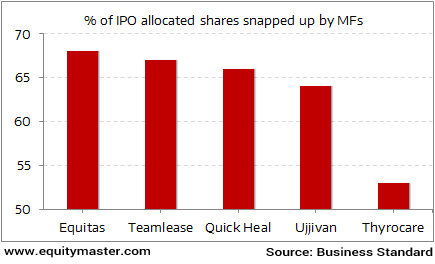 Mutual Funds betting big on IPOs..
All the recent IPOs have seen mutual funds snap up at least 50% of the shares allocated to them by way of anchor investing. Anchor investors are typically big money investors who are called on to buy shares ahead of the IPO as to inspire confidence in potential IPO investors. For knowledgeable, well informed professionals like the money managers to get lured by the temptation of investing in IPOs is a little perplexing to us.